Tony Guadagno was born and raised in Arizona where he was a competitive gymnast for 7 years and did multiple sports and activities (baseball, wrestling, marching band, & more). 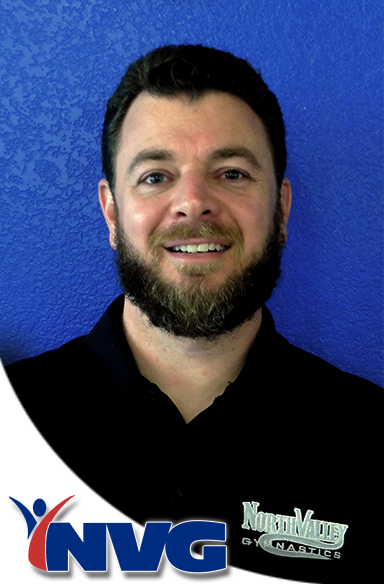 He is a certified personal trainer, has been coaching gymnastics since 2005 and has been coaching at North Valley Gymnastics since 2010. As a Boys Team and class coach he enjoys helping gymnasts and athletes attain their furthest goals and beyond. As the Boys Gymnastics & HomeSchool Program Manager he strives to grow the sport of Gymnastics while creating an atmosphere that builds strong character for athletes to reach their full potential, whether their time at NVG is spent reaching their highest abilities in gymnastics, or applied towards other sports.